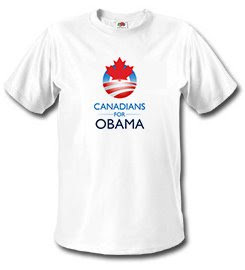 Yup, there's a growing group of Canadians supporting Barack Obama for President of the United States. In fact, they're so enthusiastic they have made trips to the states of Washington, Oregon and Texas to support the Democrats. They even have t-shirts for sale (available online). It looks like Canada will re-elect the incumbent on October 14 with a majority in Parliament this time, which would be spookier than the current government, and I would be looking for ways to relocate to Obama and Christine Gregoire-land.